The 2003 Honda XR70 Dirt Bike for Sale that is in good condition and is very clean. 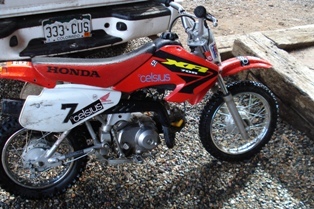 The 2003 XR70 has an automatic transmission and is a great dirt bike for learners. I'm asking $1,100 or best offer and you are welcome to email me for specs and details using the form on this page. (and don't forget to mention that you found this ad on Strike Lightning's Used Dirt Bikes for Sale gogocycles.com) or you can email me your questions and offers using the space below provided by Strike Lightning (and PLEASE include your contact information!) and I will respond with answers to your questions or after consideration of your best offer as quickly as possible. Strike Lightning would also encourage bikers to submit a review of the 2003 Honda XR70 Dirt Bike for Sale to make the biker community aware of any problems that are common to this used Honda dirt bike or to highlight its positive features and help potential buyers make informed decisions.